The Weeping Madonna of Syracuse is one of the most unusual of the approved miraculous images of the Blessed Virgin Mary and it is one of the latest. Another remarkable fact is that although this image is world famous there are few sites featuring Our Lady of Syracuse and the miracle. Mary has many many sites on the web that extol her virtues, her intercessory powers, her hope for sinners, her beauty and power with God, Madonna art and lore, but no major American site on this Madonna; so we decided to post one of our own: The more Mary is desecrated in society and on the web----sites seem to be popping up on the web----the more Catholic Tradition wants to offer the Mother of God as hope for the world, her merciful bounty, her beauty and power with God, her hope for sinners who think they are hopeless and have no one to make sacrifices for them or to pray for them, hope in the midst of the darkness of modern despair, materialism, lust, and the new pantheism that has attached itself to certain aspects of the environmental movement and even in the Catholic Church. 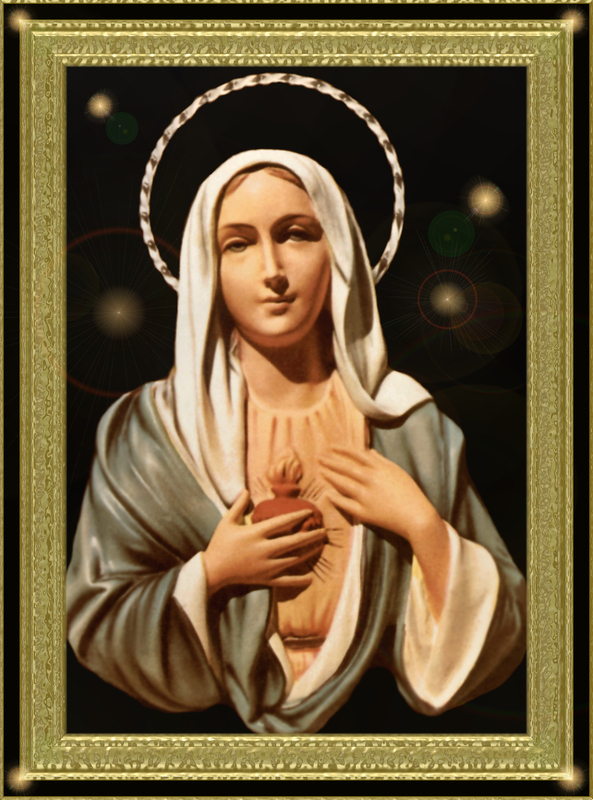 The image you see above is a print of a plaster sculpture or plaque, of the Immaculate Heart of Mary; the plaque was mass-produced in Tuscany, italy and shipped to Syracuse for retail. One of the plaques was purchased as a wedding gift. After it had hung in the humble home of the Iannuso couple, the image unexpectedly and prodigiously shed tears for four days. The veneration paid this image in a church built especially for it has been approved by three Popes, but only after an ecclesiastical tribunal scrupulously studied the miracle and had the tears scientifically examined. It has been said that never has a miracle been so thoroughly investigated, nor approved so quickly. The history of the image begins with the sculptor, Amilcare Santini, who modeled it in three days "under artistic inspiration." It was made of plaster dissolved in water and poured into a mold and turned out to dry in the sun. it was then sprayed with a varnish to render it suitable for painting. One of the plaques was given as a wedding gift as we said, to Antonina and Angelo Iannuso who were married on March 21, 1953. At the time they were tepid and neglectful christians, they said, but they hung the image with some devotion on the wall behind their bed. Angelo was a laborer who had taken his bride to live in the home of his brother on Via Degli Orti 11, Syracuse, Sicily. When Antonina discovered she was with child, she was unfortunately afflicted with toxemia that caused her to convulse at times and experience some blindness. At three in the morning on Saturday, August 29, 1953, Antonina suffered a seizure that left her blind. By 8:30 that morning her sight was restored; when she was able to see, her eyes were on the Madonna, which, to Antonina's amazement was weeping effusive tears. At first the others thought she was hallucinating due to her illness, but Antonina insisted she wasn't. her family looked again and they could see the tears run down the Madonna's cheeks and onto the bed. The neighbors were brought in and they confirmed the tears. One of the many visitors who examined the plaque at close range was Mario Messina, who was highly regarded in the neighborhood. After observing the slow formation of the tears, he removed the image from the wall. looked at it thoroughly and was satisfied that the tears was not the result of an internal reservoir. After the plaque was dried, two tears immediately reappeared. News of the phenomenon spread rapidly throughout the city, bringing crowds that forced their way indoors and gathered in the streets around the house. The security inspector, with the couple's permission, hung the plaque on the outside of the house to satisfy the curiosity of the people, but later, seeing that the crows showed no sign of diminishing, the picture was taken to the constabulary in an effort to reduce the confusion. The image wept while outside the building and during its transport, but after 40 minutes at the police, when it did not weep, it was returned to the Iannuso home. On Sunday, August 30 at 2:00 in the morning, the weeping image was placed on a cushion and displayed for the curious who had remained in the street throughout the night. The plaque was nailed above the main door on Monday, and its tears collected by the people on pieces of cloth and wads of cotton. During this time skeptics became convinced, and many of the sick were healed. That same Monday, to protect the plaque from falling, it was brought to an improvised altar outside the home of the Lucca family who lived across the street; after the recitation of the Rosary, it was returned. Three priests visited the home during this time, one of whom notified the chancery, which assembled a group of clergy, four of scientific background and three for reputable witnesses, to comprise an investigating commission. On the specific instructions of the chancellor, the group met at the Iannuso home on Tuesday, Sept. 1 to study the phenomenon, collecting a sample of tears for analysis. The plaque was examined while it wept and while the liquid collected in the cavity formed by the hand over the heart. The commission examined the smooth finish and found no pores or irregularities on the surface. The backing was removed and the unfinished gypsum was scrutinized and found to be dry, even though tears collected on the reverse. Six coats of nitrocellulose colors were counted on the image; these were covered with varnish. Using a sterilized pipette, a sample of tears was collected, placed in a sterile vial, and taken to the provincial laboratory to be examined by doctors and chemists. human secretions used as a comparison during the analysis. the the liquid examined analogous to human tears. The report was dated September 9, 1953 and signed by the examining doctors. Concerning this commission and the various investigations conducted, we must realize that the Church is never in a hurry to pronounce her judgments on such occurrences and that She acts with maximum caution and prudence, ready to affirm miracles only after positive and unquestionable proofs have been extended. Nevertheless, sufficient proofs were apparently given, since a favorable judgment was rendered in a relatively short time. unanimously announced the judgment that the reality of the facts cannot be put in doubt.
. . . we acknowledge the unanimous declaration of the Episcopal Conference held in Sicily on the reality of the event. Will men understand the mysterious language of those tears? The medical commission that was nominated on October 7, 1953 to scientifically examine the 290 cases of reported cures, decided that 105 of these were deemed to be of "special interest," or likely miracles, which were reported within a few years of the incident. The first person to experience a healing was also the first to observe the weeping. From the time Antonina Iannuso first saw the tears, she recovered completely from severe toxemia and gave birth to a healthy son on December 25, 1953. This is all the knowledge that we have of the miracles specifically. But we do know that the Weeping Madonna caused a world-wide sensation around the world. That this interest was the result of collective hallucination is rejected by authorities of the shrine where the image is now kept. Apart from the separate groups observing the tears in several locations, there was the tangible evidence of the saturated cloths and cotton. Numerous unbelievers or skeptics tasted the salty tears for themselves, thus excluding hallucination by over-excited believers. Moreover, there was motion film coverage of the actual weeping. The question of condensation is also eliminated because that would have necessarily have had to include the entire image and nearby objects, but only the corners of eyes were emitting the tears. The reliquary presented to Archbishop Baranzini on the occasion of the fiftieth anniversary of his ordination ids of special interest since it contains the tears collected by the commission. The reliquary is comprised of three layers, the bottom of which contains cloths saturated with the tears, a vial of the tears and some cotton wool that had absorbed the tears; the second layer has four panels depicting the events. The third and highest layer has a crystal urn which holds another vial of tears: the tears in it are now crystallized. The little house on Via Deggli Orti 11, where the Madonna first wept, is now an oratory where Mass is often said. The image itself is enshrined above the main altar of the Santuario Madonna Delle Lacrima, built especially to accommodate the crowds that continue to gather to pray before the holy image. Why did the Madonna weep? Many theories have been offered which remind us of the tears Mary shed at the foot of the Cross and of those shed by her at La Salette. During one of the visions of St. Catherine Laboure on July 18, 1830, St. Catherine noticed that the Virgin looked sad and had tears in her eyes. Perhaps we should pray the words engraved on the base of the reliquary and wonder with Pope Pius XII if men will understand the mysterious language of the tears . . .